Here's my ride with my new wheels... Thank you Jerzey!! You have a very clean Max...looks great!! Very nice!! More pics please!!!! What size tires are you running in the rear? it's not as slammed has it looks. I think it's the shadow, but my front is about as low as yours is. I had black wheels and got tired of that look. I felt like every one in my area had a white car with black wheels. I'll post a close up of the wheels it's actually has a gunmetal face. Nice.. What are the offsets? I know how you feel. I've always had black/machined lip wheels, even on my last car. Those wheels look crazy! Can't tell, but looks like the front needs spacers to match the rear. And the car looks like it has some rake, rubbing in the rear? GOOD EYE...! yes, I'm thinking of getting some spacers for the front. the rear tires are a bit wide (275) with the offset being +38. had to roll the fenders a little bit. when it's time to buys some rear tires, I'll stretch some 255 on there with some spacers. see if I can get it "hellaflushed". Looks great. I like the staggered look. they look good . i prefer your old setup tho. i didnt know one could fit so many star of Davids in one rim. The Altima and your car are setup different, so there may be several reasons for this. 1) The wheels look way bigger on the Altima. 2) The tire sizes are different. 3) The Altima (if it's the same one that had MRR's) is on bags and is a LOT lower than you. 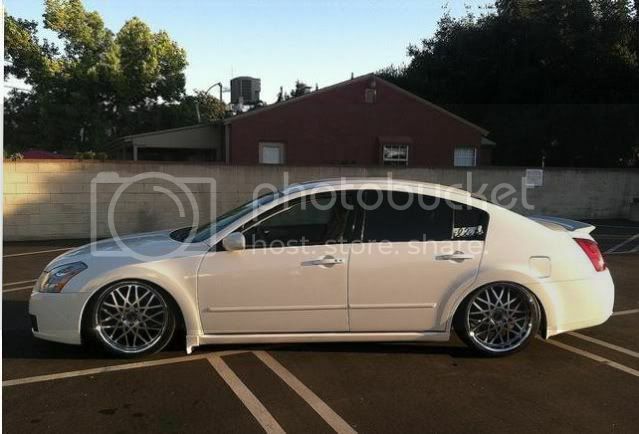 4) Wheels with a lot of spokes/face usually look better on slammed cars with no wheel gap (tucking tire). Not sure how far you want to go to make the wheels look better, but here's a couple examples for you. Rear lowered so there isn't any rake. I think the last picture kind of shows how slammed cars can make wheels look a lot different. I kinda like em. Need more pics please.